Hurricane Irene strengthened on its path toward the continental United States in late August 2011. Hurricane Irene shouldn't slow preparations for upcoming NASA launches from Florida's Space Coast, including a moon-studying mission slated to blast off Sept. 8, the space agency says. 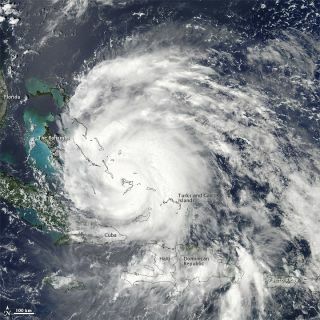 The latest forecasts call for Hurricane Irene to stay about 190 miles (306 kilometers) off the Florida coast, passing due east of NASA's Kennedy Space Center (KSC) at about 4 a.m. EDT Friday (Aug. 26), NASA officials said. That path should bring some rain and strong winds to KSC. But the facility will stay open, and NASA will continue to prep the GRAIL mission — which will send two spacecraft to study the moon's interior — for its Sept. 8 launch from nearby Cape Canaveral Air Force Station. Irene is cruising north through the warm Atlantic, gaining strength as it travels. Forecasters expect the storm to grow into a Category 4 hurricane today (Aug. 25), with wind speeds topping 131 mph (211 kph). Irene should stay out to sea from Florida, experts say, eventually making landfall in North Carolina Saturday and perhaps hitting northeastern states on Sunday. The storm's outer bands might end up lashing KSC with 1 to 3 inches (2.5 to 7.6 centimeters) of rain and winds around 50 mph (80 kph), NASA spokesman Allard Beutel said. But those weather conditions aren't serious enough to shut KSC down. "We are going to remain open for operations," Beutel told SPACE.com. "We are extremely lucky that we're not getting a direct hit from this." KSC has been in a heightened state of awareness and readiness called HURCON IV (hurricane condition 4) since Monday, Beutel added. This status means the area could get slammed with 58 mph (93 kph) winds in the next 72 hours. Rather than slow down any preparations for the launch of GRAIL (Gravity Recovery And Interior Laboratory), the hurricane actually moved things along a bit. "We moved up our schedule a couple of days," Lehman said. "We actually put the fairing on the launch vehicle a few days ahead of schedule, on Tuesday, in order to prepare for this." The fairing should help protect the twin GRAIL spacecraft from the elements, researchers said. And the launch should proceed on schedule Sept. 8. "I feel very comfortable that the spacecraft are going to be safe during the storm," said GRAIL principal investigator Maria Zuber of MIT. "Trying to understand how the moon formed, and how it evolved over its history, is one of the things we're trying to address with the GRAIL mission," Zuber said. Another goal, she added, is "to try to understand how the moon is an example of how terrestrial planets in general have formed." The twin GRAIL probes will chase each other around the moon at a very low orbit, just 34 miles (55 km) above the lunar surface. The distance between them will change as they move, owing to regional gravitational differences on the moon. The spacecraft will be able to pick up the resulting distance differences, and with incredible precision — less than the diameter of a human red blood cell, Zuber said. Scientists will use these measurements to figure out the gravity field. Knowing the lunar gravitational field in such detail should allow scientists to understand the moon's structure — and by extrapolation its evolutionary history — like never before, researchers said. "I am predicting that we're going to find something — and I don't know what it is — that is really, really going to surprise us and turn our understanding of how the moon and other terrestrial planets formed on its ear," Zuber said. In addition to GRAIL, NASA is also prepping another mission to launch from Cape Canaveral in the coming months. The Mars Science Laboratory, which will drop the car-size Curiosity rover onto the Red Planet's surface, is scheduled to blast off in late November.